Happy New Year! One of the trends in photography is 360-degree panoramic photos and videos, variously called photospheres, "virtual reality," or VR. Photospheres have been around for many years, but several recent developments have come together to make it much easier to produce and share panoramas, making them accessible to casual photographers and audiences. While much of the spotlight in 2016 is on virtual reality devices such as the Oculus Rift and Playstation VR, part of the trend is the increasing number of 360-degree cameras that can capture photospheres. One such device for capturing photospheres is the Ricoh Theta S. It is the third generation of the Theta, which first came out in 2013. The Theta S takes photos and videos with 360-degree horizontal and 360-degree vertical field of view. 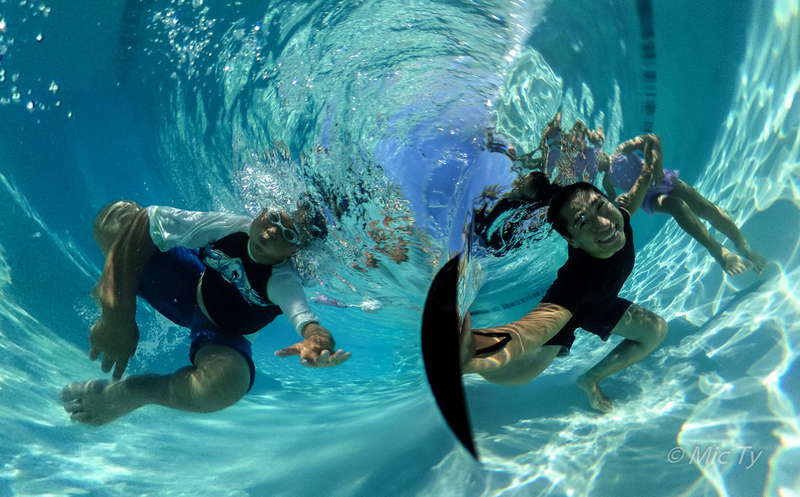 Unlike panoramic photos with some cameras and phones, the Theta S captures its photospheres with a single shot, making it possible to capture movement and action in real time. Separate from the increasing interest in VR shots, I think the Ricoh Theta S is a very good camera for family photos and vacations. Many family photos are taken for documentary purposes, i.e., to memorialize events and places we've been to. Especially in this age of social media, photos help us share our stories with friends and family. 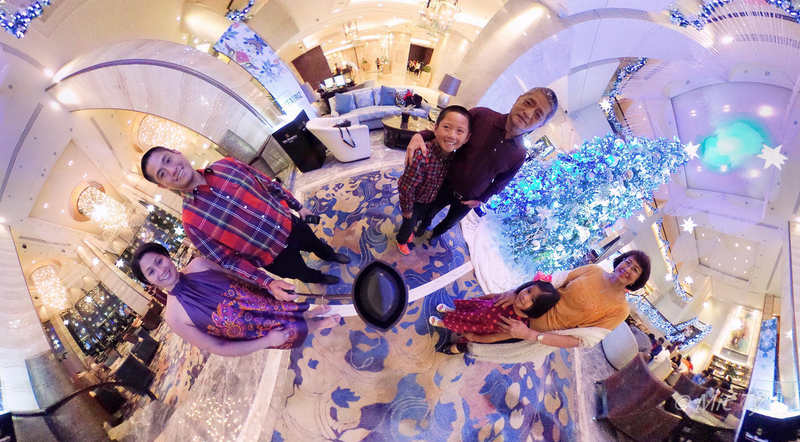 The Ricoh Theta S serves that function very well. Another approach was to use a 360-degree mirror which would reflect into a lens (catadioptric design). Examples include GoPano and Kogeto Dot. The disadvantage of the catadioptric approach is that it will have a relatively large blind spot along the stem of the mirror - the thicker the stem, the larger the blind spot. A variation on this approach is to use a very wide angle fisheye lens and point it upward, so the periphery provides a seamless 360-degree view (although the vertical field of view is around 235 degrees or less). That is the approach used by cameras such as the Kodak SP360 and 360fly. Ease of use - precise stitching of a 360 degree panorama requires skill. You need to find the camera's nodal point and be able to rotate the camera around it. There are brackets designed specifically for that purpose and they are quite expensive. Stitching the images together can also take time. Because the Theta takes a shot at a single moment in time, it does not run into problems with elements that move. Near-instant review - you can see the 360-degree shot almost right away instead of having to stitch it together first. 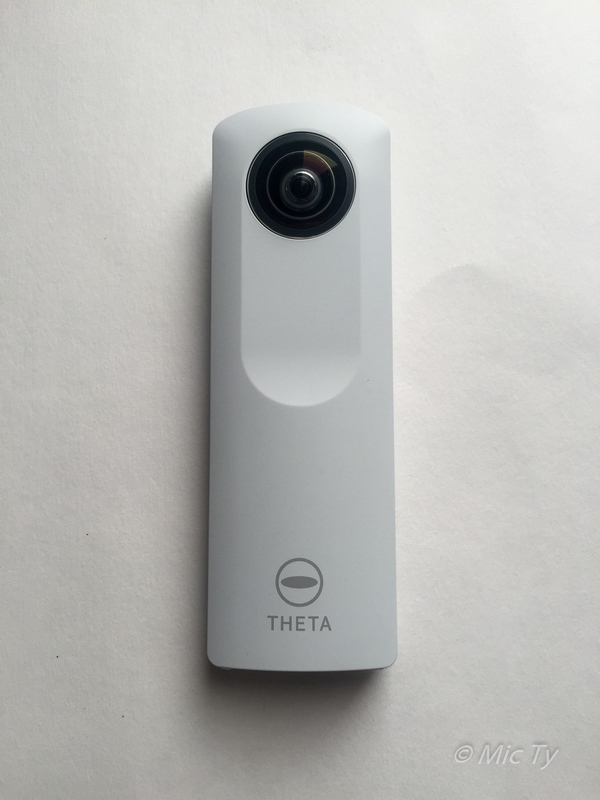 Compared to a catadioptric design, the Theta has a smaller blind spot (which translates to a wider vertical field of view), and is less prone to dust. It arguably has a higher image quality because a catadioptric design requires a lens with high resolution, especially at edges. In the shot below, I used the Theta to capture not just our lunch, but the surrounding area as well (actually even the wall "behind" the view here, although the wall is not shown in this crop). The wide angle gives additional context, and the subjects are framed by the Christmas decor on the edges, and the converging lines on the ceiling. 2. Immersive photo. By giving the audience a 360-degree view of a location or event, a Theta image creates an immersive experience for your audience. This shot of a toy store doesn't just give the viewer a view of the colorful toys but surrounds the viewer with them. 5. Getting it all in. The Theta's ability to capture the entire surrounding view can be used to take a photo of an immense environment. I used the Theta to take a photo of the new hall at Tom Bradley Terminal at LAX. 6. Group shots. When I take a photo of a group, especially during a meal, it's not easy to get everyone in the picture, unless people go out of their way to stand up and pose as a group. 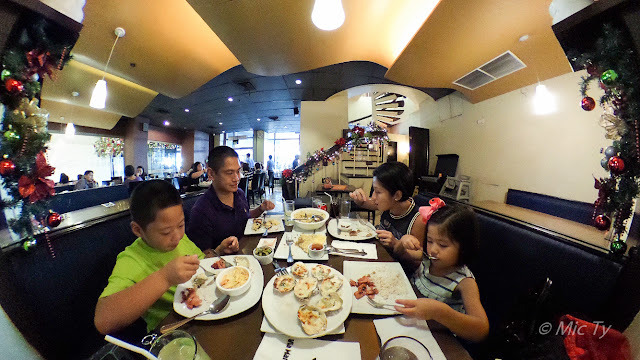 I used the Theta to take a photo of a holiday lunch with my family. 7. Context for a subject. The Theta can show multiple points of view simultaneously, which can be used to capture not just the subject but another compositional element that can give context for the subject. In the shot below, I used the Theta to take a photo of my daughter at a balloon popping game at an amusement park. The Theta not only captures the focused expression on my daughter's face, but the expectant expressions on the onlookers, the balloons to be popped, and the prizes being offered. 10. Un-selfie. Selfies are ubiquitous but they can also be boring and can make the photographer seem self-absorbed. Images taken with the Theta can also include the photographer, so technically yes they are selfies, but there is so much more to the image than a photo of the photographer that the image appears less narcissistic. In the photo below at a Legoland concert, I used the Theta to capture the performers, the artificial snow, and the audience's delight. Although I'm in the shot, the photo doesn't give the impression of being a selfie. Honestly, if you're buying a Theta, the S has so many improvements and it's not much more expensive than the original Theta or m15, that you may as well get the S, unless you're very sure that you won't need or want any of the S' improvements. The S still looks similar to the original and m15 but adds a dedicated button for switching between photo and video. There is also an indicator below the shutter button showing whether WiFi is on, and whether the camera is in photo or video mode. On the bottom of the camera, there is a new HDMI port for livestreaming to an HDMI recorder. The Theta S is available only in black. Taking photos with just the Theta itself is simple. The cameras are panfocal so there's no need for any kind of autofocus. 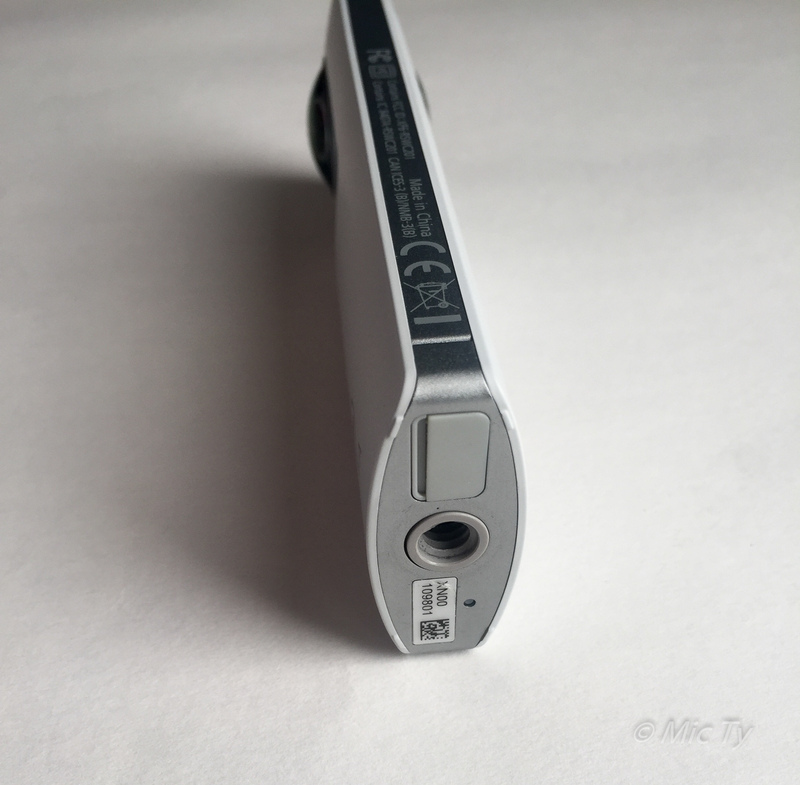 Exposure is automatic when using the Theta by itself. Technically, the only thing you need to do is press the shutter. However, composition can be tricky -- see below (Theta Details: Composition). The S also allows you to either one of two options: noise reduction mode and DR (dynamic range) compensation mode. The former is for low light situations, and the latter is for scenes with wide dynamic range. Both modes will cause the Theta to take multiple shots then combine them, so any movement can result in ghosting. They work best with a tripod. Whether you're taking a photo using the Theta by itself or with a smartphone, pressing the shutter will cause the Theta to emit a loud chirp. There is no silent mode or way to decrease the volume. There is also strangely no self-timer mode, even though it has been requested by users ever since the original Theta was released (the closest alternative is to use interval shooting). In addition to Ricoh's apps, there are third party apps for the Theta. Some are merely similar to Ricoh's own app, though there are a few that add functionality such as for bracketing HDR exposures. The Theta's flare resistance is nothing to write home about. Very bright light sources can decrease the contrast as well as produce flare artifacts. Just looking at the image as-is, I think it looks ok. However, if you zoom in to the pixel level, you can easily see the sensor's limitations. If you're not a pixel-peeper, you might wonder if the extra resolution is truly necessary. I think the extra resolution is extremely useful, particularly if you want the freedom to change the composition of the image or to use a different projection (see below under Theta Details: Editing). The improvement in image quality is significant enough that I would have been happy to upgrade from the m15 to the Theta S for that reason alone, regardless of the other benefits of the Theta S.
Both the m15 and S can take 360-degree videos. The videos have to be converted from the twin circular fisheye format to an equirectangular format that can be recognized by 360-degree viewers and players such as the YouTube app. The video quality is not very good, although it is about the same as other competitors that are limited to 1080p. Because the entire 360 degrees is being captured within a resolution of only 1080p, and because you're only looking at a portion of the panorama at any given time, the equivalent resolution is relatively low. If being able to capture 360-degree videos is important to you, I would recommend looking for a 4k-capable spherical camera. YouTube: you can upload 360-degree videos to YouTube, but first you need to convert the video using the Theta desktop app. Microsoft PhotoSynth. Now includes support for the Theta. Flickr: Flickr now supports photospheres. Just upload the equirectangular panorama. Flickr will recognize it as a photosphere. Picasa and Google+ Photos: Picasa and Google+ will automatically recognize equirectangular panoramas and allow you to view them as a photosphere. Sphereshare.net: a website for sharing photospheres. Optonaut. 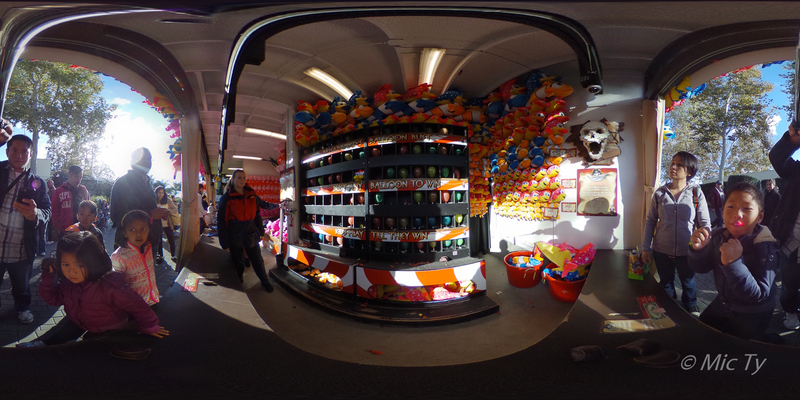 A new website that will convert your photosphere into a 3D photosphere. Does not yet support images from spherical cameras, but Optonaut staff said that they will be adding support for spherical cameras such as the Theta. Instagram. At the time of this writing, Instagram does not yet support photospheres, but Theta users are posting projections to Instagram such as tinyplanet or rabbit hole projections. Composing on the Theta might seem easy because it captures everything around it. But it's actually challenging for several reasons: First, the camera's position has a very significant impact on the image because of the very short focal length, which exaggerates distances and proportions of compositional elements. In other words, close things appear closer and disproportionately larger, while far things appear farther and disproportionately smaller. Second, the camera's orientation may affect how easily the viewer can control the photosphere. If the camera is vertical, the photosphere controls are easy and intuitive. If the camera is in any other position, such as diagonal, the photosphere controls can become confusing. Third, because the Theta captures everything around it, it is very easy to mess up the composition with distracting elements. Finally, Theta cameras don't have a built-in preview screen, and only the Theta S has live view capability (with a smart device), while the original Theta and m15 have no way of previewing the composition. - If you want subjects to appear about the same, put the subjects at equal distance and height from the camera. - If you are triggering the shutter on the Theta instead of the app, consider pressing the shutter with the tip of your index finder to move your fingers and hand further away from the lens. - The orientation of the camera affects the appearance of the image. Viewed as a photosphere, the impact is on the viewer's control. Viewed as a 2D projection (equirectangular or otherwise), the orientation changes the appearance of the projection, although this can be adjusted with a panorama editing program. Ricoh offers companion apps called Theta+ and Theta+ Video for editing images and videos respectively. Both Theta+ apps allow you to apply Instagram-style filters. Theta+ also allows the user to change the projection type from stereographic ("mirror ball"), tiny planet, equirectangular, or rectilinear. Strap attachment. Ricoh sells a strap attachment that attaches to the tripod socket of the Theta so you can attach a wrist strap to the Theta. I think the attachment is quite expensive. I instead use the BlackRapid FastenR Hitch for the same purpose. Eyeglass case. To protect the Theta, I put it in a hard eyeglass case, which is more protective than the soft case that comes included with the Theta. TH-1 Hard case. The TH-1 case doubles as a case and water resistant cover. The case also allows the Theta to stand on flat surfaces. Unfortunately, the cover of the TH-1 can create additional distortion and glare (from sun's reflection and from the camera's reflection). I usually carry the Theta in the TH-1 case. When I want to use the Theta, I merely uncover the TH-1, and I use the Theta with the TH-1 base. Tripod/selfie stick. I use a combination selfie stick and tripod from iKross. Waterproof case. You can use the Theta underwater using a waterproof case for smartphones. It is not as clear as the image you'll get from the TH-1 but you can still press the Theta's buttons, and I've used the Theta with such a case underwater. NCTech iris360 - not portable, takes 2 minutes to stitch, huge nadir (360 x 295). $2000. Kodak SP360 - 360 x 214 degrees. Samples here http://kodakcamera.pixpro-sp360.com/ The SP360 relies on a single lens and single sensor. To provide a 360-degree view, the lens is typically pointed upward, and the 360-degree view is taken from the periphery of the lens, similar to how catadioptric 360-degree mirrors are used but without the blind spot in the middle. I haven't used the SP360 or SP360-4k myself, but the SP360's design seems to sacrifice image quality. First, the vertical field of view is only 214 degrees (as opposed to 360 degrees with the Theta). Second, as with most lenses, the highest image quality is typically from the middle of the lens, with the outer parts of the lens having progressively lower image quality. However, to provide a 360-degree view, the SP360 uses the outermost part of its lens, i.e. the part with the lowest image quality, while the sharpest part is pointed to the sky. 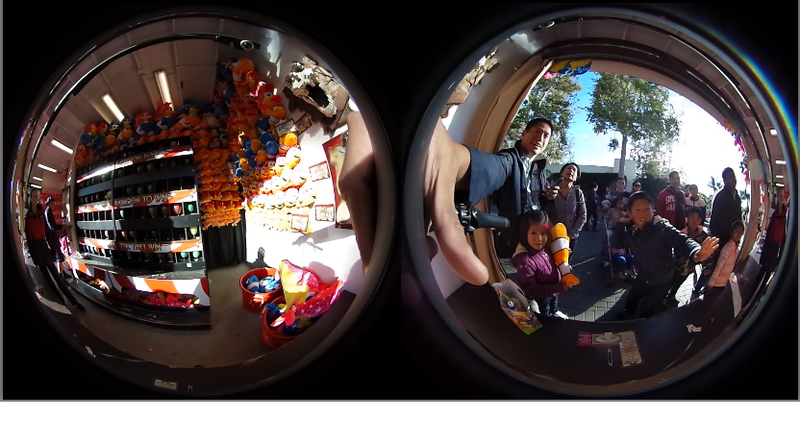 Not surprisingly, the sample images from the SP360 have noticeably lower quality than even the original Ricoh Theta (never mind the S). Kodak also emphasizes usage for video, which makes the discrepancy less noticeable because of the lower resolution of 360 videos. The Kodak SP360-4k ($499) has higher resolution, but has the same design issue that relies on the weakest part of the lens. For higher image quality and/or for a full photosphere, you can combine two SP360 cameras back-to-back. To Kodak's credit, they have software that automates stitching the two videos together. However, using two SP360 cameras increases the cost. 360fly - similar to the Kodak SP360. Uses one sensor and one ultrawide fisheye lens. V.360 ($449) - 360x60. Single 16mp 1/2.3 sensor. Single catadioptric lens design. Bublcam ($799). 360 x 360. 4 cameras. Luna 360 ($299 - $399). 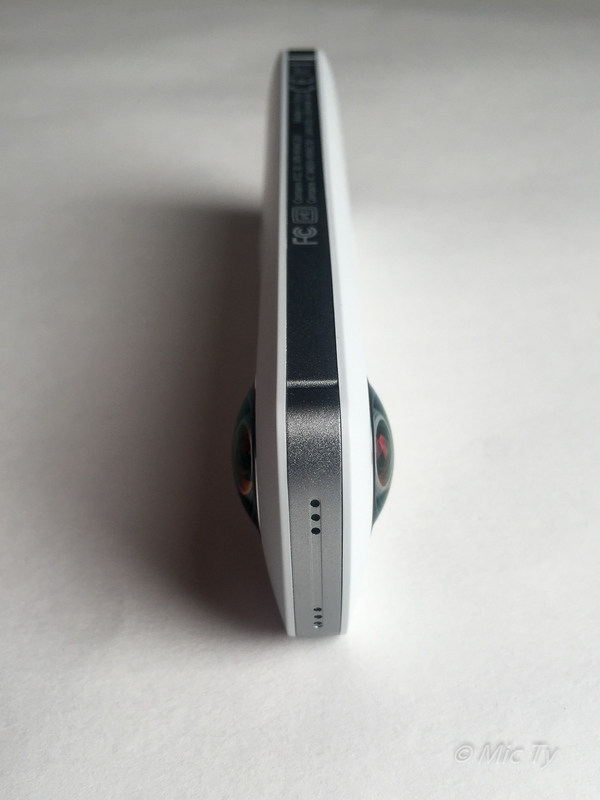 Crowdfunded 360 x 360 camera. Uses two 190-degree lenses with 5mp sensor. Giroptic 360cam ($499). 360 x 300. 3 185-degree lenses. Less distortion than Theta. Nikon Keymission 360. This recently announced camera from Nikon uses two fisheye lenses like the Theta. It promises 4k video resolution therefore it may have a higher quality sensor, but I expect the price to be at least $800 if not higher. It is due for release this Spring 2016. Catadioptric adapters for phones and cameras. 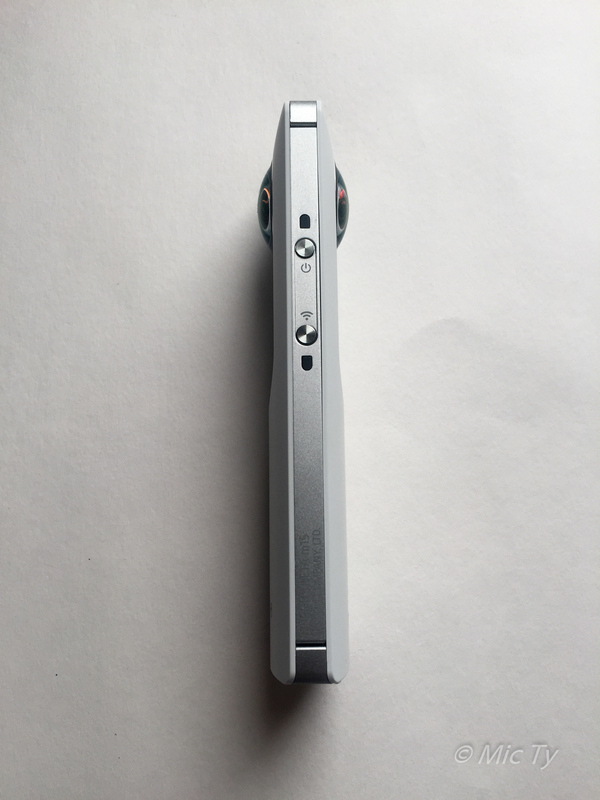 It's been a long time since I have found a camera that I found as intriguing and unique as the Ricoh Theta S. It's an amazing camera that creates many possibilities for both casual users and artists looking for a new creative tool. I highly recommend it if you're at all interested in a 360-degree camera. 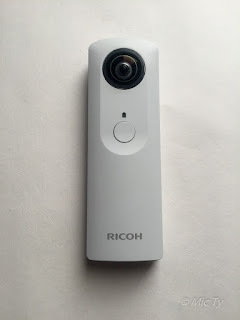 If you found this review helpful and would like to get a Ricoh Theta, please consider purchasing through this Amazon affiliate link (it adds nothing to your cost). Thanks! 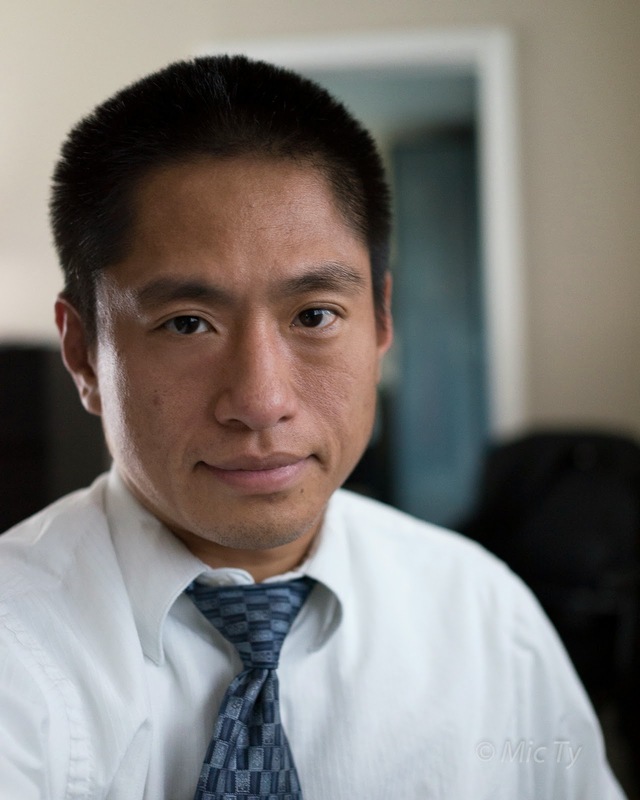 I'm an amateur photographer, and I've been shooting since 2007. I started this blog in 2009 to help me learn photography and to help other photographers. Most often, I take photos of people and events, though occasionally, I shoot other subjects such as products, architecture and landscapes. Most of my shots are candid, though I do setup shots from time to time. I have had photos published since 2010. I have had several interchangeable lens cameras, and several lenses, including Nikon, Olympus, Pentax, Sony, and Samsung. My Flickr album is here (hasn't been updated in a while): http://www.flickr.com/photos/13451101@N05/ .